Presented by New Balance, with support from InsideTrack, this meet has firmly established itself on the PA calendar as an early season must-run. Now in our 4th year on the very popular venue at Kutztown University, we plan to continue to improve on the fun that is unique to cross country and this meet. This nationally certified, all-grass course is a true cross country challenge. Coaches who raced it in college, rave about it as one of their favorites. No killer hills (It is, after all, early season). It is fan-friendly by using two loops which pass the start/finish at about the half-way point, and then goes over a new section before looping backward for the final mile. 2014 will have all the cool stuff from PTXC-1 through 5, including chip timing, great awards and entertainment, meet T-shirts for sale, and more to be announced in the coming months. in 2011, it was Piccirillo again. in 2013, it was repeat finalist Regan Rome of Dallas. Injured toward the end of XC, our PTXC5 Champ, Weisner was unable to run the Northeast qualifier. Competitively, this year’s PTXC-6 Races will feature top PA distance runners. Adding to the excitement this year will be a pre-season team video contest open only to registered and competing teams of PTXC-6 with very cool, customized New Balance gear for the winning team. Once again, we'll be doing video of each race from the front with a gator... and have great awards, music and food. The meet is open for online registration using the MileSplit system, and closes when the meet reaches capacity. Sanctioned for NY, NJ, MD, DE, WV and OH. Others as needed. 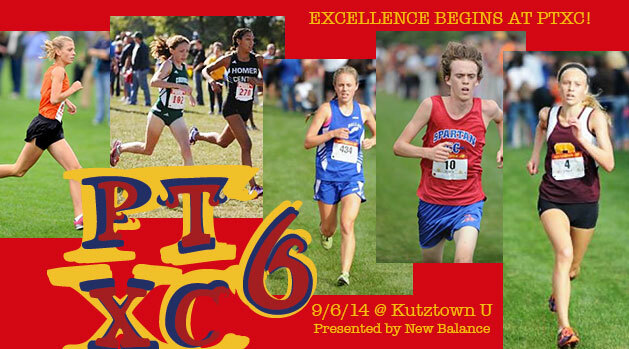 PTXC-6 welcomes all of our 2014 competitors for what promises to be a great day of cross country. This year's meet headquarters is again at the Hampton Inn on Route 100 near I-78, with a great special rate of just $89 for up to four, and includes a hot breakfast. Go to: Hampton Inn, Allentown, PA - When prompted, click the Add Special Rate Codes and enter PT6 under the Group Code box after selecting the date and number of rooms. Deadline for making reservations is August 10th. this meet has now established itself on the PA calendar as an early season must-run. Since the days of selling arch supports to police officers and waiters, New Balance has been a brand concerned with meeting the needs of the everyday athlete. To ensure the best fitting, best performing shoes and apparel, New Balance focuses on improving our technology and production methods. New Balance has maintained five manufacturing facilities in New England where they continue to rely on the skills and teamwork of our American workforce to produce a percentage of our athletic footwear. New Balance has also remained strongly committed to a core set of company values that include integrity, teamwork and total customer satisfaction. Today, New Balance sponsors some of the best track and field athletes in the country including world 1500m champion Jenny Simpson and world championship finalist Maggie Vesey.